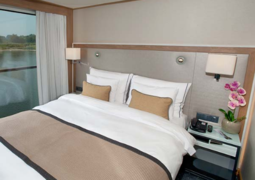 Go for the Viking Sigyn for some of most comfortable river cruise experiences out there. 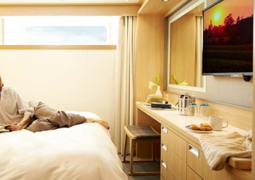 The ship showcases innovative engineering, streamlined design and understated elegance. The Viking Sigyn will take you along the Rhine and the Danube. 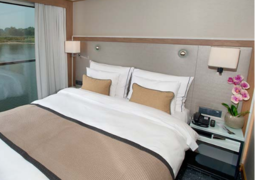 The Viking Sigyn offers a choice of cabin category, from spacious Veranda and French Balcony Cabins with a sliding glass door, to two-room Veranda Suites, each offers understated elegance and sweeping river views. The exquisite Explorer Suites boast wraparound verandas providing 270° views. On board the Viking Sigyn you will be able to dine in luxury and take in the beautiful scenery simultaneously. The lounge, bar and restaurant's floor-to-ceiling windows allow for breathtaking panoramic views. The onboard restaurant has a vast array of culinary options providing a unique and enjoyable dining experience. Go for the Aquavit Terrace for al fresco dining. Whether you're looking to take in some sun, read a book or enjoy a walk with stunning views, the Viking Vali will cater to you. With a fully equipped library on board you can feed your inner book worm. The bar and restaurant with their beautiful panoramic views are the perfect places to unwind.